Today is a perfect day to start our “Madtini Hot Cocktails of Winter” Series. Today, we woke up to several inches of fresh new snow, minus temperatures and a nose biting wind chill factor. Every few days over the next week or so, we’ll post a new drink that we’ve tried, that will hopefully do a little bit to take away the chill from our long cold winters. And a request to Madtini.com readers in warmer climates, we’re very open to opening up a Caribbean headquarters for Madtini. Start with light brown sugar, add ground cloves, cinnamon, diced lemon rind, nutmeg – then top it off with Sailor Jerry spiced rum, boiling water and a generous teaspoon of ‘real’ unsalted butter. 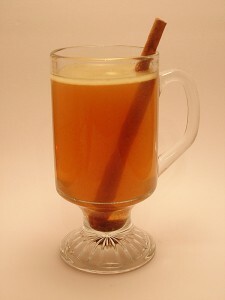 Toss in a cinnamon stick to get things stirred up. Drink recipe adapted from Epicurious.